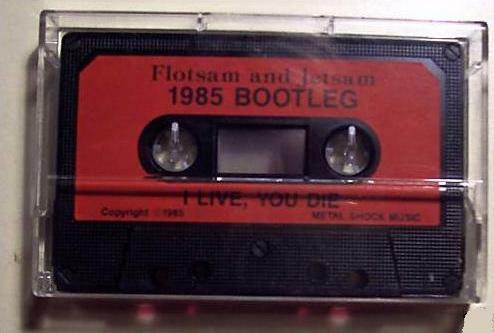 This is a pretty good demo from the kind of Thrashy, Speed Metal band Flotsam and Jetsam. Many people call these guys Thrash which I think is a mistake. The riffs are really the only kind of Thrashy part of the music; the rest is definitely Speed Metal. The vocals are completely Speed Metal vocals, also the emphasis on leads, rather than riffs. I think that if you buy this expecting a straight up Thrash album you are going to be disappointed. "Iron Tears" is the first song. It is the weaker of the two songs. The riffs are kind of bland, but there are a few good ones to be found. The singer really shows he knows what he is doing, by hitting those high notes at the start. It has a pretty good chorus also. So all in all it’s a pretty good song, but just a little boring at times. "I Live You Die" is a really good song. The best part of this song is the great leads on it. Check out that amazing melodic lead at around 1:05. They really show that they know what they're doing on the guitar. Also the main riff in the verses is pretty good too. The only problem with the song is that, they kind of go over board with the vocals. At times he tries to sing to high. The production on this isn't bad for a demo. I think that if I had to compare this to the first full length by the band “Doomsday for the Deceiver” I would say this is a bit better. This is simply because all of the stupid instrumental stuff that they do on “Doomsday”, they stray away from on this demo. Overall it is a pretty good demo and if you can find it, it's worth picking it up.